Inspired by antique traditional and classic designs, Sweet Home Stores King Collection offers exclusively elegant area rugs featuring intricate oriental and delicate floral and lattice patterns in rich color pallette to add classic charm and character to your space. The timeless floor coverings of the past are reimagined for a glorious regal and contemporary look that will instantly stand out and impress your guests. 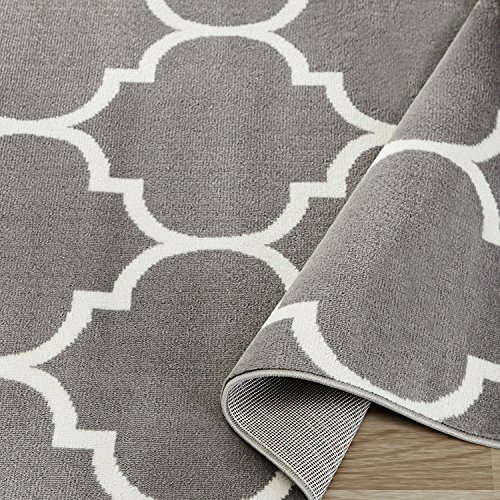 This rug features a simple yet classy geometric ogee design with conspicuous Moroccan trellis motif in neutral ivory hues on the grey base composing a blend of traditional and fashionable flair. Dense construction ensures durable and long-lasting service and premium quality polypropylene pile provides stain and fade resistance, which all make this rug suitable for any room at your house with hassle-free maintenance. Contrary to the conventional thought, these timeless traditional rugs are ideal for casual living spaces as well as luxurious living rooms. They will suit most home decor and stand out as the favorite piece whichever room you choose to place it in. Set a rug from Sweet Home Stores King Collection to your living room, dining room, bedroom, hallways, office or any room you choose and embellish your space with its sophisticated and authentic look. It will be more than worth the price and exceed your expectations. Sweet Home Stores earned customers’ spurs and has been a trusted brand for unparalleled quality and style in the home decor category.This rug gives off an air of elegance, glory and regality with its timeless classic design.